JG Development, Inc. was founded in 1990 by Jeff Grundahl and is now co-owned by Jeff and his wife Mary Grundahl. Jeff and Mary are long-time residents of Mount Horeb, Wisconsin. Together, their goal is continued growth of JG Development and its four divisions, and the industries and communities they impact. Mary has a professional background in sales. She is the current president of the Mount Horeb Chamber of Commerce Board of Directors and current chair of the Mount Horeb Economic Development Corporation New Business Outreach Committee (MHAEDC). Jeff has more than 25 years of experience in residential and commercial new construction and remodeling, and entrepreneurship. He is a National Association of the Remodeling Industry (NARI) Certified Remodeler and the 2016 recipient of a NARI Lifetime Achievement Award. He currently serves on the NARI of Madison Board of Directors and MHAEDC Land Use Development and Workforce Development Committees. 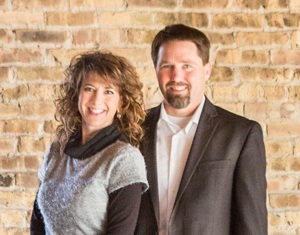 Jeff and Mary are proud to lead a team of nearly 50 professionals who operate from the company’s offices in downtown Madison and Blue Mounds, Wisconsin. At JG Development, we know that our team is the key to our success. We are committed to creating a workplace and jobsites where integrity and accountability are encouraged and recognized. We offer competitive pay and benefits, and high-quality training and resources. We are always interested in connecting with qualified and motivated construction professionals. Please contact us if you are interested in a career with JG Development. We invite you to explore our galleries of current and recently completed projects in various stages of construction. It doesn’t always look pretty during the process, but the end results are often stunning and always completed to customer satisfaction. If you have a question about a particular project, send us an email or give us a call at (608) 437-6181, and we’ll be glad to help you.